The plants we use can be found growing wild in most yards or woody areas or can be purchased, already dried, for under $2.00 a month. Or, if you want to have an ongoing supply for about $2.00 a year you can plant some in your back yard. These plants do not need to be cared or cultivated for. Once they are outdoors, Mother Nature will do all the work for you, so they are easy plants to keep! 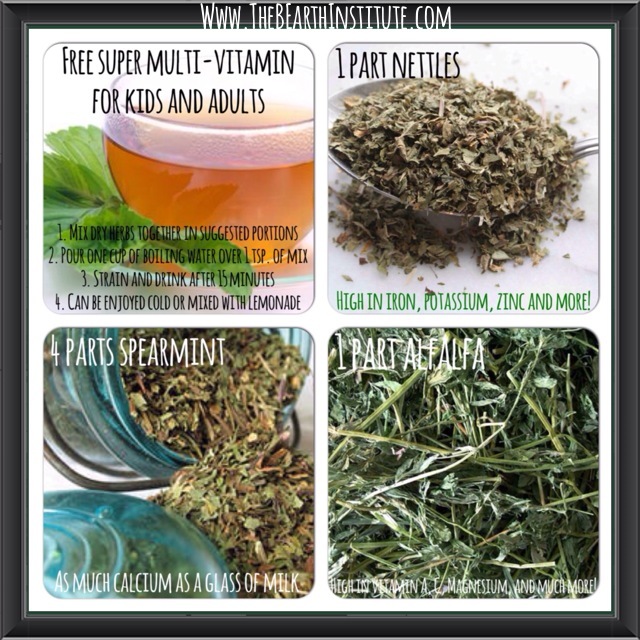 The trick is to mix the tea with 1 part Nettles, 1 part Alfalfa and 4 parts spearmint. In those proportions the spearmint overtakes the grassy taste of the nettles and alfalfa and convinces people that they are just drinking spearmint tea. We use spearmint rather than peppermint because it is safer for children and can be easily tolerated by everyone. 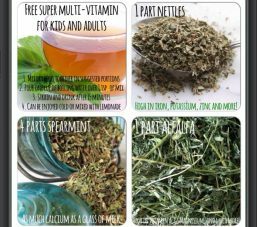 The second important factor in the effectiveness of this multi-vitamin is to let the herbs steep for a sufficient amount of time. The third important factor is to make sure you are using freshly dried herbs that have been stored properly. These herbs can be dried and stored in a dark, cool place for up to one year – after that they are not as effective. So why are these herbs such superior multivitamins? 2. The roots of the alfalfa plant are some of the deepest roots of any plant, enabling it to reach down deep into the soil and retrieve nutrients we don’t usually enjoy naturally. 3. Nettles is high in iron, calcium, magnesium, niacin, potassium, zinc, vitamin A and C. It also contains protein, riboflavin and much more. 4. Alfalfa is incredibly high in vitamin A and C. It also contains generous amounts of calcium, magnesium, manganese, thiamine, phosphorus and much more. *If you look at the history of multi-vitamins the content changes every year based on current knowledge. Scientists discover new substances every year that are beneficial in foods and are always discovering more. In general it is also recommended that people should get their nutrition from foods first and then vitamins. Herbs are categorized as food. 6. The side effects are amazing. Nettles is used as a “cure all” in Europe. Spearmint is known to help with all digestive issues – all the way from bad breath and issues swallowing to stomach and intestinal pains. Alfalfa is a popular remedy for arthritis, joint pains and blood purification and detoxification.